What’s the biggest challenge with attempting to judge young Cabernets? They typically show poorly in their youth… As barrel samples Cabernet can look great, but once in the bottle most straight Cabernet Sauvignon looks gruff, gangly and frequently, well, rubbish. This lineup of eight Cabernets was a perfect case in point. 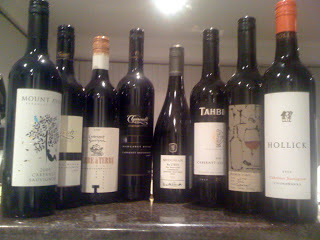 Day one I opened and double decanted all of these and followed it up with a proper ghetto decant* an hour later (All best practice tasting there). On the first day I was underwhelmed. Depressingly underwhelmed. So underwhelmed that I started to worry that my love affair with Cabernet might be ruined (did I mention that there is more Cabernet/Cab blends in my cellar than any other variety?). The following notes then may look a little discombobulated and schizophrenic, but I can’t stress enough how much just a little bottle age would/could help turn some of these frogs into princes (or at least just better looking frogs. Maybe). A “challenging vintage” according to the Tahbilk notes, and I hate to say it but that’s obvious from the first whiff. It smells of a warm and hot year, of caramelised, slightly strained fruit, of raisining and dustiness. Yet by day two that fruit begins to settle back in again, almost as if it’s found a second wind. The palate is fresher, with a flush of berries to complement the drying tannins. Actually, the tannins are the hero for this wine, they look a little desiccated and dried out on day one, but by day two they were holding everything together. Produced off exclusively estate fruit, this was given 10+ days on skins and spent 18 months in (30% new) French oak. Normally a very reliable drink, I think it’s a somewhat riper wine than is usual for this label, a perception which is announced via some of volatility on the nose, over concentrated and warm, dusty, jammy berry fruit. It’s ripe on the palate too, perhaps a fraction too much so, with the berry fruit looking a little cooked and bitter, the tannins a fraction sticky and dry. Recognisably Margaret River and carrying some proper regional eucalpyt and cedar, it’s pleasant enough though probably overripe in the scheme of things. By day two it looked a little more composed, but only fractionally so, with hard tannins and with more pronounced oak too. 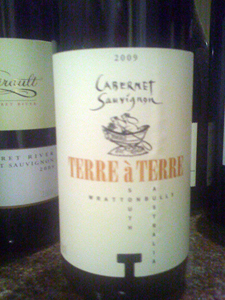 From a hot, warm and windy vintage, this includes 10% Cabernet Franc in the blend. Sourced mainly from the older Hollick plantings (all 25yrs+ and planted on prime terra rossa soils) this spent 20 months in French oak (30% new). 10 day open ferment, new French and American (!) oak for 16 months. I’m still puzzled by why you’d be using American oak with Cabernet (it works for 707 I s’pose). Extended (2 weeks) cold maceration post ferment. 21 months in oak, 100 days (exactly) in a 4,000L foudre. Close spaced (1.5m x 1.5m) plantings. The real deal. Such attention to detail makes this wine. I like the amount of love that all the Flaxman wines get. Open fermenters, minimal pumping, 20 months in French oak. There was only 85 cases of this wine made apparently. Drawn from a vineyard in Moculta (which is on the Barossa/Eden Valley edge). 92% Cabernet Sauvignon, 8% Merlot. Comes off the estate’s original 1976 plantings. Open ferments, 10 days skin contact, 18 months in French oak (40% new). *A ghetto decant involves pouring a glass out of a bottle and then, using the headspace left in the bottle to ‘decant’ by shaking vigorously until the wine is frothy. Can also be done by pouring into a glass and placing a hand over the glass. Special note to make sure the bottle/glass has a well secured lid/hand over the top or otherwise serious spillage can occur.